It was December 1972 and Pappy was ill. He’d caught a cold from me, a cold I’d brought home from school and, as always, it had gone to his chest. He only had one lung after all. For days he’d been coughing and wheezing. My own cold had turned into a chest infection and I was off school myself which was almost unheard of. Mother made me go to school no matter how sick I was but they’d promptly packed me off home when they saw my feverish face and I’d been sent to the doctor for some penicillin. The little capsules proved impossible to swallow so Pappy opened them up and I had to take the bitter tasting powder on a teaspoon. Mother had to go to work and, with Pappy unwell too, she’d enlisted the help of my Auntie Winnie to look after us both until she got home. Auntie Winnie was one of my favourites so I quite liked having her there. Pappy had been sitting in his chair all morning half asleep and I’d been reading a book. I was always reading a book. When he got up I didn’t take much notice at first but he staggered across the room looking very unsteady on his feet and muttering something I couldn’t quite make out. To my horror, I saw the front of his trousers darken. He’d wet himself. Auntie Winnie saw it too and, without saying a word, quickly ushered him out of the room and up stairs. He was insensible with fever and didn’t know where he was or what he was doing. When Winnie came back down, quite some time later, she made light of it, saying he’d gone to bed because he wasn’t well. I couldn’t forget what I’d seen though and I didn’t know whether to be embarassed or worried. Pappy didn’t come back downstairs and, as I was still ill, either Auntie Winnie or Auntie Gwyn came to look after us both every day while Mother was at work. Once my cousin Bryn and his wife Holly filled in when neither auntie could make it. This felt like a real treat because I didn’t see him very often. He was my hero because he had a motorbike and a black leather jacket. Even so, I couldn’t stop worrying about Pappy. He’d been ill before but never like this. One afternoon there was a terrific row between Gwyn and Mother. Mother hadn’t long come home from work and I was in my bedroom reading when I heard the shouting. Sensibly I stayed where I was and pulled the covers up over my head. Gwyn and Mother didn’t get on at the best of times, both being rather strong willed women. Suddenly there was a crash and the sound of breaking glass. It made me jump almost of out my skin but I didn’t dare go to see what had happened. There was silence for a while then I heard the front door slam. Later I found a framed picture of me, a pastel drawing done when we were at Butlins, in the bin. The glass was broken. Whether Mother had thrown it at Auntie Gwyn or Gwyn had thrown it at Mother I never did find out. It was my favourite picture too. At least I found out what the argument was about. Mother came storming into my room not long after Gwyn had left. When Mother was on the war path I knew better than to argue with her so I followed her downstairs. She was grumbling all the way. 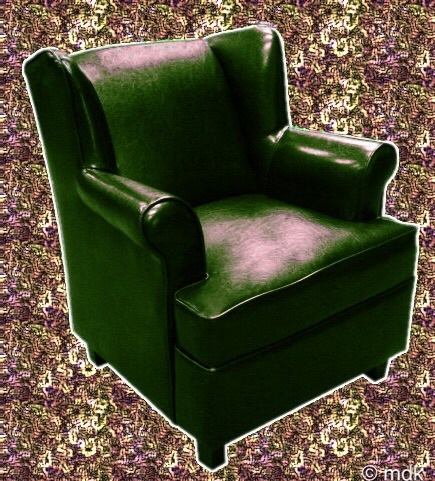 The two armchairs were massive dark green faux leather things with wide arms and big wing backs. Still grumbling and swearing Mother began to pull at one of them, slowly moving it across the room. “You push and I’ll pull,” she said, so I got around the other side and pushed with all my might. Somehow we managed to get it out of the door by turning it half on its side. Then we were at the bottom of the stairs. 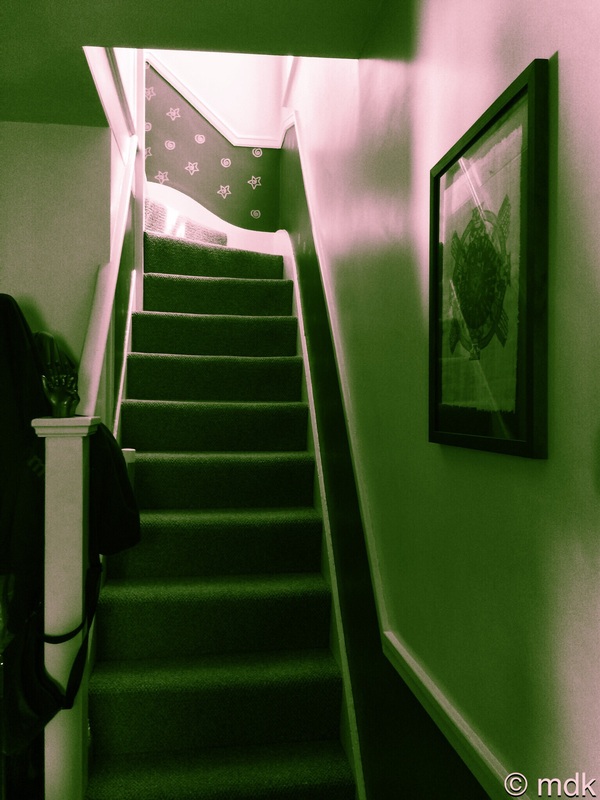 I looked at the narrow stairway and then at the chair, I couldn’t see how we were ever going to get up to the top, never mind around the tight corner onto the landing. Mother was determined though and, little by little, she dragged it while I stood underneath pushing against it with all my twelve year old weight. I was crying, sure she’d drop it and it would fall and squash me. Stair by stair we inched our way up. My legs and arms were shaking with the effort and I could hardly see through the tears streaming down my face. It seemed to take hours. When we got to the corner it got wedged. Mother was pulling with all her might, grunting and swearing and I was beneath it squashed against the wall, hardly able to breathe. When it finally came free, mother fell back onto the hall floor and I almost fell down the stairs, but we’d done it. After sitting for a while gasping for breath we managed to shove the monsterous chair along the hall and somehow get it through the door into Pappy’s room. He was laying in bed, white as a sheet, hardly aware we were there. There was just room beside the bed to squash the chair in. As I was going out of the door he stirred. “It’s amazing how a woman’s body heals,” he muttered. It frightened me even more than moving the chair to think he was locked in an imaginary world full of mud and rats, reliving the trenches of France and worrying about the time I broke my fingers when they were shut in the door. Mother ushered me out of the room. He never did sit in the chair. In the early hours of the morning on Christmas Eve I heard Mother talking to someone in the hallway between my bedroom and his. Who she was talking to, I couldn’t say. It might have been one of my uncles, or the doctor. No one replied so she may have been talking to herself. Whoever else was there I knew at once that he’d gone. I lay in my bed, halfway between sleep and wakefulness and listened to her footsteps going down the stairs. Tears streamed down my face. Pappy was everything to me, my friend, my playmate, my storyteller, my grandfather. Then I heard a noise coming from his room. It sounded halfway between a cough and a groan. For a brief happy moment I thought I was wrong and he was still alive but he wasn’t. The noise, I later discovered, was very real, but it was just air escaping from his dead body. Nothing would ever be the same again. It’s never easy and it doesn’t ever get any easier. I think I was 7 when I went to my first funeral. It certainly doesn’t get any easier. They didn’t let me go to Pappy’s funeral. Mother said I was too young. I actually think it’s better to go. It gives a sense of closure. It’s always sad when you are young and suddenly you notice the family talking about illnesses and what the future holds. I was fortunate enough not to be forced to go through a period when several grandparents and distant relatives passed away, although I now wish I had as they were almost a mystery to my younger self. That poem is undeniably sad but although it has a sense of inevitability to it, I find it very consoling. I always feel I was very privileged to get to know my grandfather so well. Losing loved ones is never easy but these things make us stronger I think. I love that poem too.